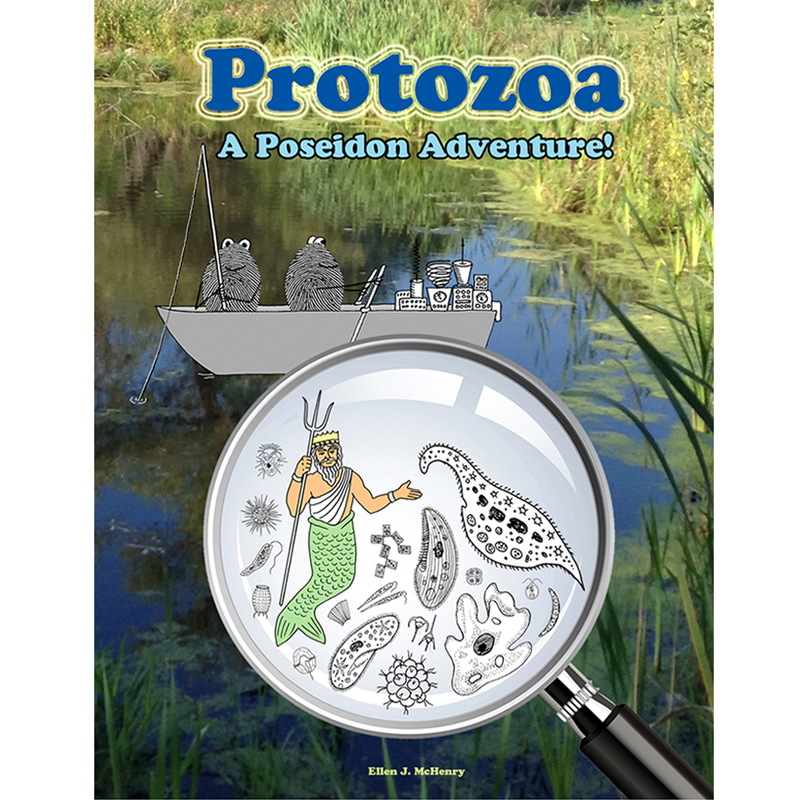 Category: Protozoa; A Poseidon Adventure! DESCRIPTION: Join the “fingerprint people” as they go on their best adventure ever! Their rental boat turns out to be a shrinking machine that makes them small enough to go fishing for protozoans like Paramecium and Ameba. After learning how to measure very small things in units called microns, they interact with many bizarre-looking creatures. Pond scum turns out to be tiny living organisms that sometimes have complex and sociable lives! The protists you will meet in this book include ciliates (Paramecium, Stentor, Spirostomum, Dileptus, Loxodes, and more), flagellates (Euglena, Chilomonas and a few others), green algae (Chlorella, Spirogyra, Zygnema, and others), diatoms, dinoflagellates, cyanobacteria, and ameboids (amebas, heliozoans, radiolarians, foraminiferans and slime molds), and, in an optional epilogue, some harmful protists (malaria, Giardia, Trypanosoma, Entamoeba histolytica). You will learn a lot about cells and what their organelles do, and you’ll meet autotrophs who make their own food, heterotrophs who must eat food, and some cells that do a little of both. In addition to the “science-y” aspect of these creatures, we’ll also take time to appreciate their beauty. The first part of the book is a student text (about 80 pages with both B&W and color illustrations), giving you all the information you’ll need. At the end of each chapter there are some pencil and paper activities such as word puzzles. Also, you will be directed to a playlist that was set up on YouTube just for this book, where you will be able to watch real protozoans in action. (This means you don’t need a microscope. If you have one, that’s great, but you don’t need one.) As an added bonus, we’ll highlight the vocabulary words from that chapter that came from Greek or Latin (staged as a funny battle between Zeus and Jupiter). Can I use this with a high schooler? Content-wise, absolutely. The science is well into high school territory. It is the interest level that is geared to middle school and upper elementary ages. It’s for kids who still like to read cartoons, play games and have fun while they learn. If I did use it for high school, how much credit would it be worth? About 1/4 credit (half a semester) of biology. Is it okay to copy/print pages out of the book? Yes, as long as you are using them with your own students or with your own classroom. Do I need a microscope? No.